The book contains images of various fish, contributed by 100 divers from all over the world and compiled by Naoko Funakoshi. A total 298 photos were donated by 100 divers (both professional and amateur photographers) from all over the world. The book consists of 52 pages (B5 size). 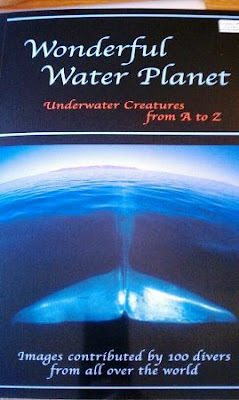 Please visit her website Ocean Lovers. About half a year ago I posted about her and her book project on this blog and now we can see the result. Naoko approached with a request if I could present this book to the school of my children on Koh Samui and possibly one or two more schools. She said that the schools or better the libraries at the schools should keep the book for all the children to see! After taking some pictures and noting the address of the schools in question, respectively the school of my son and daughter, Naoko will send another 5 copies of the book to each school. At my sons school library, from left to right; Kruu Nowarat Pechruantong (my sons teacher), Kruu Sermsook Cheeanban (owner, head teacher), Dennis Lemmens my son and myself, Camille Lemmens PADI Platinum Course Director. At my daughter's school, in front of the school library I presented the book to the main teacher Kruu Mechai Srijong. In the picture from left to right; Kruu Supaporn Taptiyapong, Kruu Mechai Srijong (main teacher), the librarian of the school Kruu Thom, my daughter Julia Lemmens, my son Dennis Lemmens, myself, PADI Platinum Course Director Camille Lemmens and Kruu Wattana U-Ratchanopakhon, my daughters teacher. The word 'Kruu' in Thai means Teacher. There's one more school scheduled to be visited, in Plai Laem on Koh Samui and I will hand them also a copy of the book. If you are interested to obtain a copy of the book and if you live on an (remote) island, I can happily get you in touch with Naoko or it shouldn't be rocket science to find your own way to her.